Hello folks, I have been watching this site for a few months now. I am a new owner of a male chow named max. his birth date is 10/8/08 We got him back last March 2009, he was still a pup. Its hard to believe how much he has grown. We love him! He is so good inside the house, he has never chewed so much as a flip-flop. We aquired him from a girl I work with who moved into an appartment that didn't allow pets. Well with all that being said, my guy Max has some issues. I didn't know where to put this in the forums. First is he likes to growl, my daughter who is 17 will come next to him if he is laying down and talk to him and rub him, he starts to growl! Then he has been growling over his food dish, you just say his name he growls. I am his primary care giver, he will growl at me when he is eating. I don't know if this is typical of chow's or is it teenage years. Please if someone can give me some tips or ideas I can use. I have tried various things and none seems to curb his growling. I am afraid it will escalate into something worse. I want to stud him some time, or should I get him neutered, and will this help. Thanks for your time. Welcome to you and Max! We like pictures so we hope to see pictures of your Chowling soon. I suggest you read this thread: viewtopic.php?f=18&t=6605&p=77233&hilit=NILF#p77233. Essentially, Max needs some NILF training right away. As for neutering...there are so many Chows that need adoption. I would need to let the experts advise if neutering would help reduce the aggression issue. Hi and welcome and like someone else said we like pictures, lots and lots of pictures. Okay, now that the greeting is done, let's move to more serious matters. Your chow boy is pushing you, he's at the age when he's trying to move up the pack ladder and if you let him he'll take over. You have to take that leadership posistion away from him firmly, fairly and consistently. First like someone mentioned, start NILF immediately, that stands for Nothing In Life is Free. He has to do a behavior to get anything and everything. When you feed him make him sit and wait until you put his bowl on the floor, (also have others do his feeding etc at times to push the point in that ALL humans especially those in the house are above him in rank) When you give him treats have him sit and give a high five, go for a walk, he has to sit or stand calmly to get his leash on. Those are the overt ways to enforce the idea that he's not the boss. The more subtle ways are these; 1)You never ever allow him to go in or out a door or door way before you, you lead, 2) never walk around him or step over him even if it is easy for you to do so, make him get up and move out of the way, I say "excuse me" and if they don't move it, then I drop my voice an octave and say very firmly, "MOVE". 3) growling is not allowed toward a person, drop your voice and say "No, or Hey, or my favorite, "what do you think you're doing?" Actually, that last is done when I don't need a quick response. "Hey" is for those times I want whatever to stop immediately. You want him to respect you at all times, and with a chow that respect must be earned, they don't give it automatically. Chows are very intelligent the way a wolf is, I've noticed during the past years 15 or so years I've owned them, that they don't wait for a person to do for them, they will pick up their dish and bring it to you to show you it's empty, they will open doors to leave a place without you doing it for them. They will think their way into and out of things, places and situations most DOGs will give up on. This intelligence is what makes them independent, they don't need you, not really, you have to prove to them that life is far better with you then without you, but life with you means your rules, not theirs. Subtly asserting yourself as pack leader combined with NILF will teach him this. To neuter or not. First if you're neutering him to change his behavior and he's over six months old, it will not make a big difference in his behavior, he might calm down a little, but not enough to not do all the things above. Second, if you don't have a good history on him, like his parents, grand-parents and even great grand parents, don't breed him. 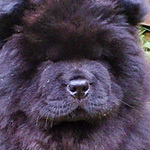 Chows have several genetic problems, among them the worst tendency toward elbow dysplasia of all breeds, they also have hip dysplasia, and severe knee problems. They have a 20% higher risk of terminal stomach cancers and thyroid problems. They also have what's called entropian, (where the eyelids rub against the eye and can cause scarring which can lead to blindness) Your boy may be perfect and have none of these problems but without a good idea of his genetics he shouldn't be bred as he could carry the genes for problems and pass them on. Welcome to the world of chows, be confident, be fair, be firm and have a good sense of humor and you and your boy will bond and become partners as you should. Welcome! Lots and lots of pictures, please. Then, NILF is a necessity with our chows. They are smart enough to manipulate us into doing what they want, so we have to be vigilant in teaching them we are in charge. If you let this slack a chow will try to move up the ladder, sometimes subtly, other times overtly. Please note: that absolutely does not mean you should physically force your chow to be submissive. That only creates an angry chow, not a respectful one. That said, I wonder if he is truly growling at you? Chows talk to us more than most dogs. And they have many different vocalizations, not just bark, growl, or whine. Most of mine have huffed and puffed to communicate a need for attention. If this is not properly responded to a quiet noise, less than a bark but somewhat similar to a growl is the next step. Some chows almost purr when happy, like during a belly rub. It is amazing how much they have to say. And those unfamiliar with "Chowese" are often intimidated by it. My girls tried to tell the cleaning service personnel where the treats were and that they should give them some, and freaked them all out. They were sure the vicious chows were going to attack. I heard screams from the kitchen and came down from my office at a run. And I walked in on the two girls sitting very nicely and wagging their tails, right below the treat jar on the counter, talking away. (I almost fell over laughing, while trying to explain the girls were just begging). Now I clean the house myself -- Oh, well. Thank you for the ones who posted a reply to my last post. I will try and put the NILF into action, My boy Max, does all the snorting, whinning, and growling. Sometimes its funny just to watch him, he will go to the window and see who is coming down the street. He knows when my kids are home or have gone out. We have gotten him to sit, shake a paw, and lay down. Very easy to train him doing those things. In the morning when he needs to go out, he will come and snort in my ear or lick my arm. He is for the most part very submissive. I always have him sit when I put the leash on him, which he does very well. Try to get out the door before him well that is another thing, when he has to go, look out. I will try and post and some pictures soon ( I need my daughters help with that) Hope you all have a great day! I taught Bramble to wait when we went out together by opening the door and every time she moved forward in front of me I shut it again and said "Wait". It didn't take long for her to realise she was going nowhere unless she waited. I think that chows are always looking for chinks to rise up a little in the pack but continual training and making clear rules that you expect to be followed really do help over time. Bramble and I have a face off every night about sitting before you get your food. She will stand for ages just calmly looking at me as if to say "Wont" but eventually she gives in. It helps if you stand very straight and dont look at them in these situations. They know what is required of them so you have to wait till they decide if it is worth their while. Always give them time to think before repeating the command as they are not quick to give in if it means a step down the pecking order.